Jacklyne Ogutu is very concerned about her family village in Nyatike Division, Migori County. She grew up there in rural Kenya and now, as she goes back from time to time, she is concerned about the breakdown of the community. She has formed a local NGO called Lean on Me to address some of the issues including early marriages, general promiscuity including teenage pregnancy, HIV/AIDS and STDs, children working in gold mines, child-headed households and general poverty. This is an area traditionally mined for gold and there are still some mines in the area. This attracts many hard living men to the area with money which means there is money for girls who want it and are willing to get into prostitution. Lean on Me has 18 members who oversee the development and impact of the work. They are committed to this community and to addressing the issues, as are other members of the community. The basis of this partnership is to support the established table banking groups and boost the funds available to them. It also aims to empower girls in regard to education, social and economic welfare through various means. For a number of years Jacklyne had a growing concern for the area where she grew up. As she visited she noticed many things that concerned her and heard stories that shocked her. She formed a group of friends and relatives to try to find out the needs in the community. On completing that survey in 2010 she determined to do something. Hence, Lean on Me was formed. *High Primary School enrolment had been experienced because in 2003 the Kenyan Government provided free primary school education which enabled even the most unfortunate children (OVCs) in society to access basic education. Primary school admission had doubled from 40%-80%. Narrowed to gender, the highest number of children enrolled was the "Girl Child". *Despite the promising numbers of girl child admissions, there was a shocking result discovered from the survey carried out. It revealed that the number of girls admitted to school in Standard 1 in 2003 dropped drastically in 2007 and 2008. From a sample school, Standard 2 in 2004 had 25 girls but by 2010 the number dropped to 7 in Standard 8. This implies that more than 70% of the girls had dropped out of school by 2010. *There were other results concerning issues that affect the girl child indirectly, e.g. 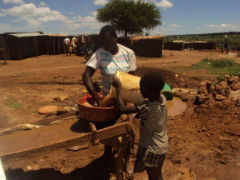 poor water and sanitation, limited health care services, cultural practices, lack of skills, disease out break, under equipped schools, under staffed schools and poverty in general. From the sampled villages there were seven child-headed homes and a great number of widows calling for a need to support orphans and vulnerable children in this community by facilitating feeding programs, basic needs, provision of school uniforms and learning materials. BHW's Field Director had heard about Jacklyne many times from Muthui Kisau (KEN03c) as she is responsible for training and mentoring the successful table banking programmes with FOB around Nairobi. During 2015/16 he met her three different times in Nairobi and she impressed him as a woman with passion to see her people come out of poverty. In October 2016 he spent the day with her in her village, meeting her family and friends, visiting two of the schools she is working with and being with her at a meeting with the community. Following that visit, in early 2017, a decision was made to commence partnership with Jacklyne. The direct beneficiaries are the members of the table banking loan programmes and the girls who get assistance with sanitary pads. The indirect beneficiaries are the families of those involved and the wider community through higher attendance at school and the lower number of teenage pregnancies due to the family training. There is a very strong community spirit. They have mobilised and organised themselves very well. They understand the issues and have the capacity to develop effective strategies. They have already commenced various programmes at cost to themselves. Jacklyne comes from this place and so has a vested interest in the outcomes. Jacklyne is married to Fredrick Omondi Odenyo who is a marketer at the Brand Effects Publishing Company. They have two children, Euan Alfred (born in 2003) and Cameron Gigi (born in 2008) and currently live in Uhuru Estate in Nairobi. Jacklyne is a committed committee member to both Mothers Union Movement and the Church SACCO (Savings And Credit Cooperative), and is also involved in running the church mentorship program for teens and youth at the church she attends. She holds a Diploma in Social Work and has also taken a course on Project Development and Management. After college, from 2004-2010 she worked with different organizations based in Kibira, one of the largest informal settlements in Nairobi, as a Field Officer. She worked with people living with HIV/AIDS and victims of abuse and violation, empowering women and girls socially and economically through talks and training. She was involved in helping them to form small groups where they put together their little funds which they then loaned among themselves at a low interest rate. They were able to start up small businesses and earn a living rather than depend on hand-outs. The majority of her time was spent interacting with women and girls, helping them through their challenges, and this caused her to look at her life as a child and teenager being raised in a remote poor place, Nyatike in Kikongo Village, under the care of a poor grandma who brewed busaa, a local liquor, to earn enough to live. She was not able to provide three meals a day, let alone sanitary pads which was never a priority. Jacklyne used cloths or rags and even missed school during the days of her period. Some mornings she was given busaa to take quickly as porridge before running to school. It was these experiences that have caused her to go back and give girls hope in life by talking to them about reproductive health, providing them with sanitation and to assure them of the love of God. In July 2011 Jacklyne left her job and has since been working full time with Lean on Me. She is the chairperson/director and is passionate about working with the less privileged and giving them hope. She also undertakes training on table loans to various groups. 3) Anton Saoke - Asssistant Chairperson. Anton is the overall coordinator of all the groups formed. He is based in the village making it easy for him to work with the members in the cell groups for table banking. He plans and coordinates the activities with Jacklyne's help. He is also an Elder in the community. 4) Jane Lago - Assistant Secretary. 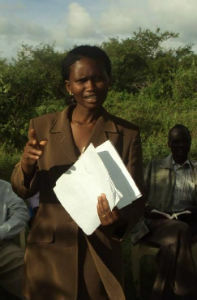 She is a teacher at Kikongo Primary School and a counselor. She coordinates the school activities and keeps the records of the groups. She is also part of the female teacher table banking group. 5) Kennedy Oongo - Organizing Secretary. Kennedy is the key person in matters spiritual. He is a religious leader and a pastor and is based in the village. To have an empowered community where girls and women fully participate in social economic development. 1) To increase the amount of funding available to the table banking projects so they can boost the income earning capacity of the members by loaning money to the groups. As the money is repaid, it will continue to be loaned out to boost new groups that are being formed. Each group has it's own committee and leadership. The organisation is not a church, nor does one have to be a Christian to join the programme. 2) To form more groups of table banking. 3) To provide disposable sanitary pads for as many girls as they are able so they can continue attending school during their monthly periods. 4) To create a business for five women making reusable sanitary pads for as many girls as they are able to help. Once this is operating the supply of disposable pads will be discontinued. There are quite a few other activities planned as well and in five years they hope to see a drop in teenage pregnancy, fewer girls having to leave school under pressure from their families to marry early and more girls completing secondary school education. They understand that this plan can only be achieved by developing a foundational economic base. Hence, the table banking underpins anything they do and they have established a number of groups with plans for this to expand. There are three components to the partnership in year 1 - 2017. Zilpah is part of the Wattendre table banking group. When they began they each bought 50/- (less than US$1) to the table each week. That's all they could start with. After one year they started bringing 100/- per week. After two years they purchased a lot of plastic chairs with the money and hire them out for occasions. Then they bought chickens and sell the eggs. It is now the third year and they plan to purchase a marquee to hire out for special events. They are self-sustaining as families now, every one of the members, it is very different than before. In the Komolo group the members borrow for school fees, food and to start small businesses. This group has not been going as long as the other and they are still finding their way and struggling a bit. But, they have sponsored an orphan child in Form 1 and one in Form 4. These people are in a sense too generous. They are making bricks and started building a dispensary which currently has reached lintel height. The biggest challenge they face is to get water to the dispensary. There is also a female school teacher's table banking group. It has helped them a great deal in their family lives. Before, they would have to borrow from shops to be able to get through the month and often their wages did not come in time. 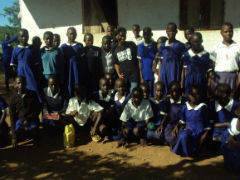 But not now, they have enough and have also put hand washing kits into two schools to help with hygiene.